Retire quietly? 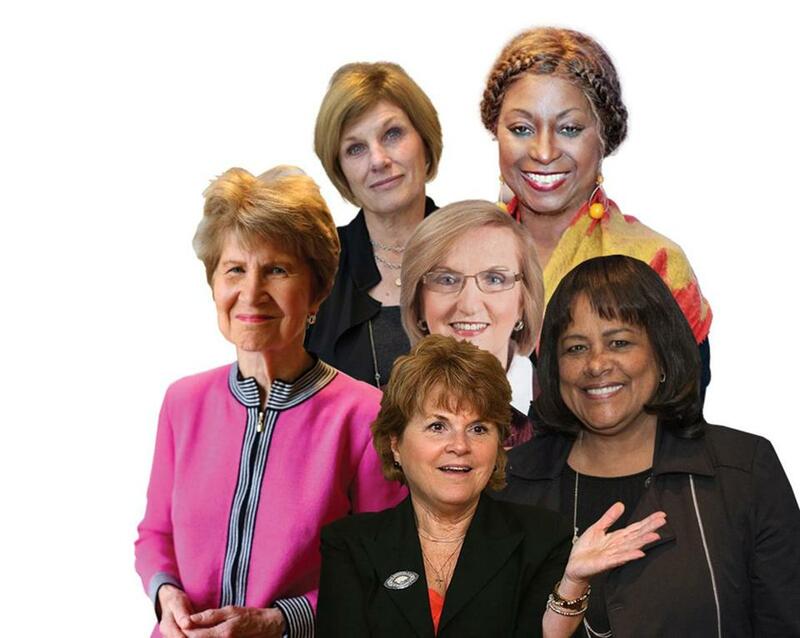 These corporate trailblazers would rather help young women rise up. Clockwise from left: Evelyn Murphy (in pink); Cathy Minehan; Colette Phillips; Linda Whitlock; Pam Reeve; and Gail Deegan (center). This story is from the Globe Magazine’s annual Women & Power issue. 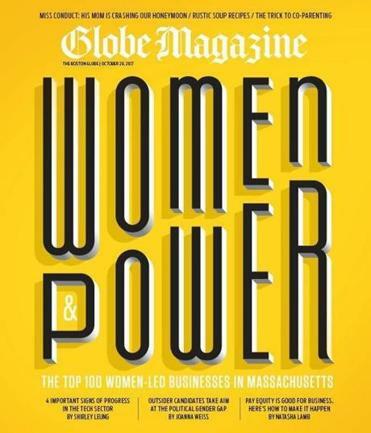 We’ll reveal the Top 100 Women-Led Businesses in Massachusetts on Friday morning. By all measures, Cathy Minehan is a pioneer: the first woman in the Federal Reserve Bank of New York’s management training program, the first woman in the Fed system to become chief operating officer, and the first woman to lead the Boston Fed. She retired from the bank about a decade ago, but looking back, she realizes that while doors opened for her, many other women were left behind. “Frankly, I should have done more for women explicitly,” says Minehan, now 71. Of course, the Fed had mentoring and other programs to help women, but not enough to counteract unconscious bias in the workplace. “I wish I had been a little more sensitive to that,” she says. What gives me hope about the future of women in Boston are examples like these, of the “old girls’ network” getting woke and helping the next generation of women rise up. It’s as if retired female leaders, and baby boomer women in general, are done playing by the men’s rules. On their own career climb, they had to; it was a matter of acceptance and survival. Now these battle-tested women are working with millennials and Gen Xers to step up the pace of change. “We need to encourage these young women to be bold and take risks because we didn’t,” says 54-year-old Andrea Silbert, who runs the Eos Foundation and recently launched the Women’s Power Gap Initiative to dramatically increase the number of female leaders across all sectors in the state. The initiative is focusing first on the dearth of women in the highest ranks of public education in Massachusetts. A woman, for example, has never served as K-12 commissioner, despite the education workforce being overwhelmingly female. And just two of 15 state universities have a female president. Silbert has taken the issue straight to Governor Charlie Baker — first in a private meeting he had in February with nearly a dozen female leaders, and more recently via a petition she organized with more than 1,600 signatures. The election of Donald Trump might have something to do with the attitude shift. When this country elected a candidate whom multiple women had accused of sexual misconduct and whose misogynistic comments were well known, some women literally took to the streets fearing an erosion of their rights. Among them were Gail Deegan, a retired corporate executive, and Beth Boland, a partner at law firm Foley & Lardner. After the 2017 Women’s March, the two decided to harness their experience and influence to fight for women and families in Massachusetts. Deegan and Boland gathered about three dozen women, all veteran high achievers — including Diane Hessan, Rosabeth Moss Kanter, Colette Phillips, Pam Reeve, and Linda Whitlock — to form the Boston Women Leaders Network, a diverse group from the corporate, civic, and public sectors that is using its members’ relationships built over decades to push for changes that will advance women locally. “I can’t do anything about the whole country. Can we commit to Massachusetts?” says Deegan, 72. “Many people mistakenly think we’re so progressive. We have significant issues to address regarding education, income inequality, lack of diversity in leadership.” Case in point: mandating paid family and medical leave. As business executives, union leaders, and legislators hunkered down this year to negotiate a deal, Deegan was on the phone every other week with Jesse Mermell, the first female president of the Alliance for Business Leadership. Deegan “wanted to know how she could help — how do we strategize?” says Mermell, 38, one of the key players at the bargaining table. In June, the governor signed a paid leave bill into law, requiring employers to offer workers up to 12 weeks of parental leave and up to 20 weeks of medical leave starting in 2021. Working on public policy marks a shift for the Gail Deegans of the world, who have tended to focus on advancing women at the top, such as getting more women on corporate boards. Why? Because if you want to close the gender gap, you need women in the boardroom who can drive such change. The two approaches should make for a potent partnership between the new and old guards. Progress will come when women across generations work together in a way they never have before. Shirley Leung is the Globe’s interim editorial page editor. Send comments to shirley.leung@globe.com.